This has been floating around since Christmas 2005, so I thought it was about time I shared it! This is a super-simple scarf and wrist-warmers set suitable for men or women of any gender (!) and it knits up really quickly. I used 2 balls Lana Grossa Multicot (60% cotton, 40% acrylic; 80 m/88 yds per 50g). 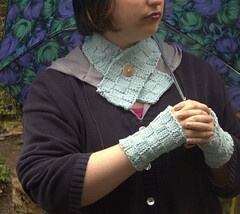 NOTE: if you make the wristwarmers larger or the scarf longer, you will probably need more yarn. Possible yarn substitutes: Rowan Yorkshire Tweed Aran, Rowan Scottish Tweed Aran, ggh Samoa, Lion Brand Cotton Ease, or any yarn that knits up at 4 sts per inch (2.5 cm) over stocking stitch. NOTE: the yarn is knit up at a slightly looser tension than stated on the ball band. This is intentional. Also available as a free PDF download from Ravelry. Use the above link to obtain the pattern. PATTERN LINK – Knit away! NOTE: this is Version 3 which fixes a mistake with the written instructions in previous versions. The charts are correct.